Security measures on the Greenway are creating unnecessary risks of bicycle accidents. In response to last week’s terror attack, the NY state DOT and the NYPD have installed extremely intrusive security barriers on the Hudson River Greenway. 57 crossings have been fortified between 59th Street and Battery Park. On more than half of them, long concrete Jersey barriers have been installed diagonally. Additionally several police cars were seen parked on the Grenway. These safety installations are forcing cyclists as well as pedestrians from both direction to use the same narrow path. They create a high risk of head-on collision accidents. On Friday mayor de Blasio said the barriers need to change so “people can still ride their bike” after many users complained about the bottleneck created by the huge concrete barriers. The Greenway can get very crowded with cyclists, joggers and pedestrians and the security installed by the State DOT and the NYPD funnel people uncomfortably close together. On Friday, the State DOT instructed workers to walk down the bike lane and to straighten out the vertically placed Jersey barriers. The DOT also said in a press conference that the barriers were temporary and that they were working on a permanent solution. No timeline was provided. Street safety advocates believe the permanent installation of steel bollards would be an optimal solution for the Hudson River Greenway. Protected bike lanes have proven to be one of the most efficient street designs to prevent bicycle accidents in New York City. 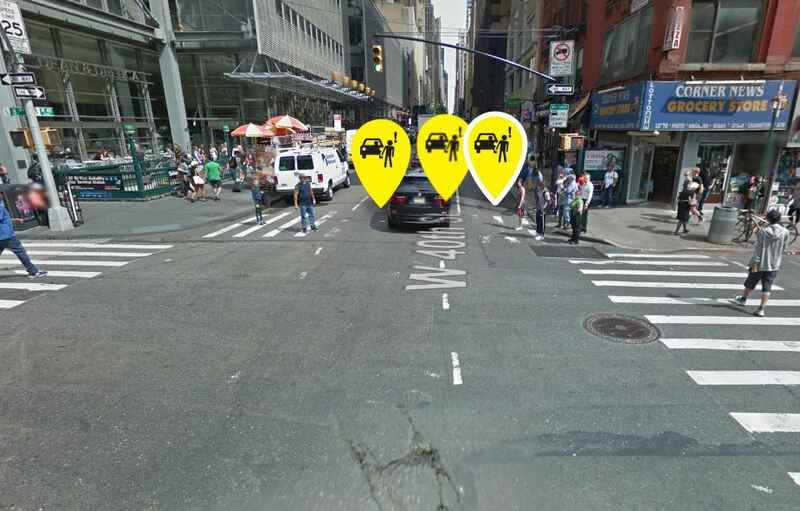 Yesterday the Department Of Transportation (DOT) announced that it was planning to add such a bike lane on 7th Avenue from 30th Street to Charlotte Street, in downtown Manhattan. The project was partially presented last night to the Community Board 4. Despite having several safer options to ride safely North or South in Chelsea and in the West Village, a significant number of bicyclists are still riding on 7th Avenue. In a 14-hour period, the DOT counted 2,350 people biking at the intersection of 20th street and 7th Avenue. The traffic is usually fluid on the downtown segment of the avenue and speeding is common, increasing the risk of serious or fatal crashes. If the project is accepted, the number of traffic lanes will be reduced from 4 to 3 and a protected bike lane will be added. The DOT believes that the project will reduce speeding and increase bicyclists safety. Pedestrian safety will be improved as well as crossing distances being shortened. People riding bikes in New York City decrease their risk of being seriously injured in a bike accident by 75% when they are using a protected bike lane. According to a 2014 DOT study, protected bike lanes have led to a decrease of 22% of pedestrian injuries and to a minor decrease of bicycle accident injuries despite a dramatic increase in bicycle traffic in the city. 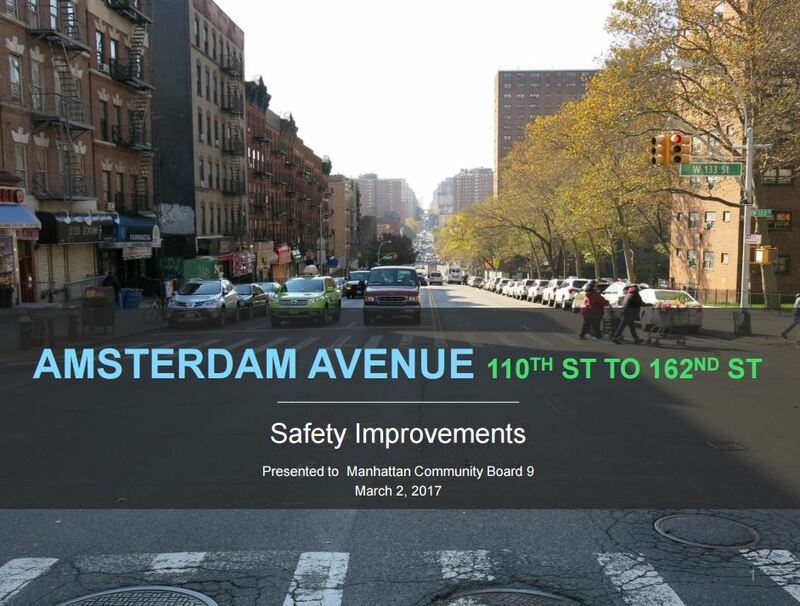 Recently a new DOT proposal to extend the Amsterdam Avenue protected bike lane with a painted bike lane above 110 street seems somewhat weak. The Amsterdam Avenue segment that runs from 110th street to 162nd street is a busy two way 4 travel lane corridor with no bike lanes. Columbia University, City College of New York, several senior centers as well as various commercial and residential buildings are located on this segment of Amsterdam Avenue. Speeding, unsafe intersections and the absence of bike lanes are making the avenue unsafe for the community. Between 2010 and 2016, 4 pedestrians died on this segment of Amsterdam Avenue. Between 2010 and 2014 8 bicyclists and 28 pedestrians were severely injured. So far this year 16 people were killed in a bicycle accident in New York City. This is the highest number of bikers killed over a period of 8 months in the city. As bicycling is becoming more and more popular in New York, it is important that bikers feel safe when they ride. Pedestrians also are at increased risk of fatal accidents. 74 people died while walking in the streets of New York. Another worrisome problem is the growing number of hit and run fatal accidents. 28 people were killed by hit and run drivers since the beginning of the year. This is higher than the total number of people killed by hit and run drivers over the complete year of 2015. This Thursday Please join Transportation Alternatives, Families For Safe Streets, Right of Way and Kidical Mass BK to ride together to demand streets safe for biking and walking. The meeting point is at Fountain of Pamona at East 59th Street and 5th Avenue in Manhattan at 6:00 pm. The ride will start at 6:30 pm. Riders want to send a message to Mayor de Blasio that “This is enough” ! Too many bicyclists and pedestrians have been killed or injured in traffic accidents in New York City this year and it has to stop. 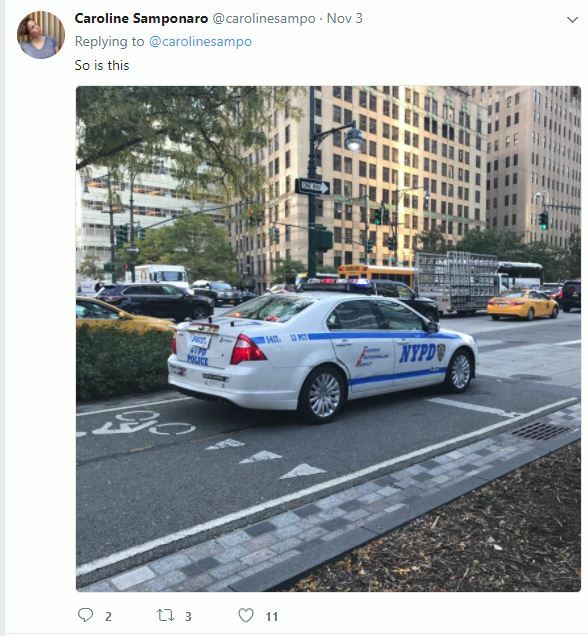 Mayor de Blasio is not doing enough to make New York City streets safe. After improving during de blasio’s first two years as mayor, the number of bicycle and pedestrian accidents are increasing again. This Thursday riders will ask the mayor to take immediate action to fast track projects related to the construction of protected bike lanes and safeguarded pedestrian crossings in areas that have been designated priority areas by Vision Zero.